Established in 1987, we are the longest standing osteopathic practice in Crystal Palace. 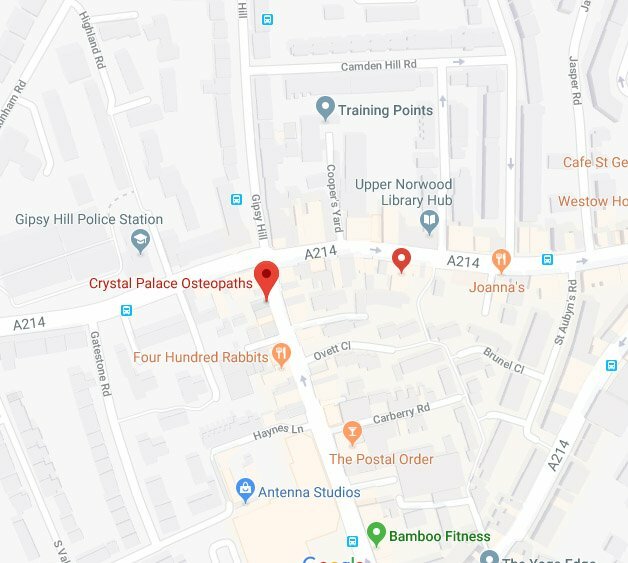 For 30 years Crystal Palace Osteopaths have been serving all communities in South East London, including Croydon, Lambeth, Lewisham, Southwark and Bromley. We have patients from far and wide including Norwood, Anerley, West Norwood, South Norwood, Dulwich, Streatham, Brixton, Norbury, Penge, Sydenham, Thornton Heath, Herne Hill, Tulse Hill, South Croydon, Shirley, Caterham, Purley, Forest Hill, Catford, Orpington, and Beckenham. If you are unsure whether Osteopathy is suitable for you please give us a call. Osteopaths focus on improving bodily function. Crystal Palace Osteopaths aim to help your body serve you as well and as comfortably as possible, to enable you to enjoy the best possible quality of life. You will need to phone for an appointment before coming along. First appointments last 30-40 minutes and follow-up appointments are 30 minutes. We take a full medical history, followed by a physical examination, to enable us to make a diagnosis and then begin to treat you. You will be asked to undress to your underwear. If you are uncomfortable with this please let us know either in advance or tell the osteopath at the start of your appointment. Osteopathic Consultation and Treatment Fee: £46.00. You don’t need a referral to see an Osteopath, although some patients are sent by their GP. Patients with private medical health insurance may need a referral letter from their GP. Please check with insurers as they have different policies. We are specialists for most leading health care insurers. Ask at reception for a receipt and then claim from your insurance company. If your Osteopath considers it advisable for you to have time off work he/she can give you a statutory off work certificate.